Politicians and activists share scepticism about international election observers, suspected of naïveté and bias but lacking political knowledge. For once, international observers mattered. On their verdict on Zimbabwe's elections on 30 July hung the possibility of infusions of billions of dollars that could pull the country out of the economic mire (AC Vol 59 No 15, The dollars after the votes). Banks, corporations and some governments, notably Britain and China, are eager to validate the elections, arguing that it would bring stability and economic revival (AC Vol 59 No 7, UK leans to Mnangagwa). So far, the verdicts range from fulsome approbation to deep scepticism. The African Union, the Southern African Development Community and China quickly judged the elections and results to be credible. The Commonwealth and the European Union were much more critical, with the United States observers concluding within days that the elections had not passed the credibility test. These were the most closely observed elections since 1980, with plenty of veteran top politicians among the monitors. In addition to the AU and SADC groups, the Commonwealth and the EU were back for the first time in 16 years. The Carter Center sent a team. Another US-backed team – the Zimbabwe International Election Observation Mission (ZIEOM), was joined by a group of dignitaries including former President of Liberia, Ellen Johnson Sirleaf, and the former interim president of Central African Republic, Catherine Samba-Panza, and former US Assistant Secretary of State Johnnie Carson. Former Prime Minister of Ethiopia, Hailemariam Desalegn, chaired the AU group, and the Commonwealth group was led by former Ghanaian President John Dramani Mahama. Over 200 foreign journalists were accredited to cover the vote. Citizens found a profitable sideline, selling video footage recorded on their smartphones to observers and journalists. Embassies were on high alert and some brought in IT experts, able to produce statistical projections and analyse algorithms. At least 800 foreign observers joined over 6,000 national observers from civil society groups. There were almost 11,000 polling stations, mostly well-organised but not all easily accessible. Few foreign observers had four-wheel drive vehicles, and they stayed out of remote rural areas. The observer missions were more a show of symbolic force, headed by African and Western experts with eminence and gravitas. That should have been enough to deter the most brazen attempts at intimidation just before the election. Yet voters in the countryside, over 60% of the electoral roll, had been energetically wooed, sometimes indirectly threatened, by the ruling Zimbabwe African National Union–Patriotic Front. There was, according to local activists, little overt violence. Instead, ZANU-PF offered short-term sweeteners – cash, food and seeds – and promises for the future, often on a village-by-village basis. As before, ZANU-PF showed a campaigning force that the cash-strapped opposition Movement for Democratic Change could not match. Yet there are big questions about the electoral roll, which is still heavily weighted to the countryside and doesn't reflect the migration to towns and cities over the past two decades. Despite voters registering on a biometric system which matched their fingerprints to their voter cards, the same system wasn't used on election day. That would have allowed impostors to vote, provided they had fake identity documents. Some officials laughed off the possibility of that happening. Observers pointed out the closeness of the declared result: ZANU-PF's Emmerson Mnangagwa avoided a difficult second round by just over 30,000 votes, winning 50.8% in the first round of the presidential election. At every stage in the electoral process, ZANU-PF had extracted all possible advantage from its incumbency: whether it was pressing the Zimbabwe Electoral Commission to use a ballot paper that gave Mnangagwa's name more prominence, or delaying the release of the electoral register until just before polling day and illegally obtaining data from the register for its campaigning, such as sending text messages to personal mobile phone numbers. Even that was not enough to assure Mnangagwa victory. 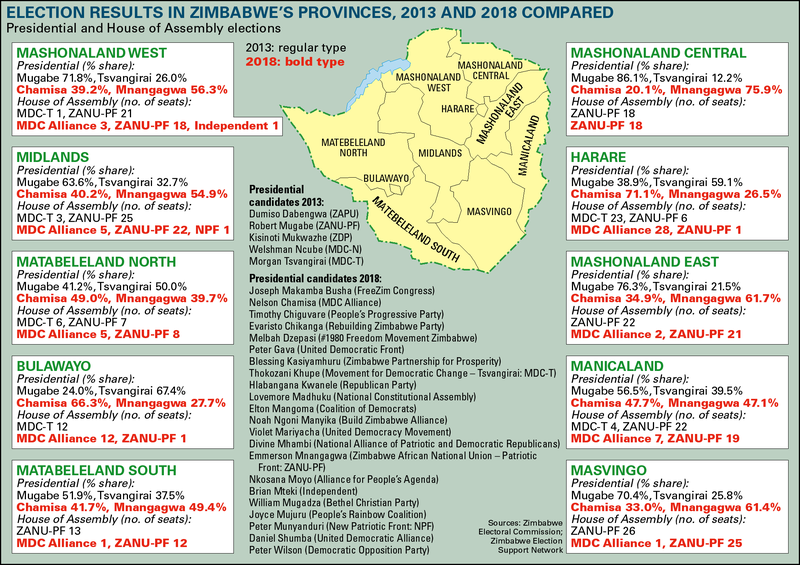 For reasons yet to be explained, ZANU-PF did far better in the parliamentary elections – winning over 66% of the seats – than Mnangagwa did in the presidential vote. In another twist, turnout for the parliamentary poll averaged at 75% but shot up to 85% for the presidential poll. Observers were trying to assess the weight of these factors as doubts were being raised over the ZEC's delays in releasing the results. At the same time, the opposition stepped up its claim that it had won the election and the people's vote was being stolen. Accusing its detractors of inflammatory rhetoric, ZEC continued to trickle out the parliamentary results, constituency by constituency. It insisted that none of the presidential results were ready. That prompted more suspicion, not least because the presidential votes had been counted before the parliamentary votes. Several observers had raised concerns about the delayed presidential results although under the law, the ZEC had until 4 August to release them. By the morning of 1 August, tension was mounting and some 3,000 supporters of the MDC gathered in Harare to protest that the election was being stolen. It was not an official MDC event and police permission had not been granted. Party leaders Nelson Chamisa and Tendai Biti were said to be out of town, prompting government officials to accuse them of stoking trouble, and then running away. Initially, the demonstration was good-humoured. Some footage shows MDC protestors shaking hands with the riot police who made no attempt to break up proceedings. Then, protesting crowds gathered outside the ZEC headquarters in Harare. Suddenly, the mood changed, armoured cars moved in leading truckloads of soldiers, most of them in fatigues, hooded or wearing balaclavas and wielding rifles and sticks. After getting off the trucks, the soldiers started jabbing protestors with bayonets and began beating anyone within reach. Several workers and traders unconnected with the protest complained of being beaten by soldiers. A group of protestors broke away to throw stones at the headquarters of ZANU-PF nearby. Some broke into the car park, smashed a few windscreens and set one car ablaze. As guards from the building opened sporadic fire, another contingent of soldiers opened more concentrated rifle-fire. At least six were shot dead, two in the back. Observer groups started rewriting their preliminary reports, adding concern about the deployment of soldiers in the capital. The government response was inconsistent and unconvincing. As Mnangagwa blamed the opposition for threatening the country's stability, officials wouldn't say who ordered in the troops, where they came from, or why many of them concealed their faces. Although the buck should stop with Mnangagwa, some of his defenders insist the order was given by Vice-President Constantino Chiwenga, the former head of the armed forces. It has since emerged that the head of the Zimbabwe Defence Force, General Valerio Sibanda, was not consulted and that the soldiers were drawn from the Presidential Guard now under the joint control of Mnangagwa and Chiwenga. The government's posturing over the shootings has reinforced doubts both about the elections and its political intentions. Nor did the violence stop there. On 3 August, hours after the official results had been announced, the MDC announced it would be holding a press conference at the Bronte Hotel, just outside the city centre. But armed police surrounded the hotel, pushing people – many of them observers and journalists – and threatening to throw in tear-gas canisters. Much of it was filmed and broadcast on the international networks, reinforcing the impression that the government had begun a violent crackdown. Eventually, a government minister turned up, recalled the police and allowed the press conference to go ahead and for Chamisa to announce that he rejected the official results. Later that day, Mnangagwa, having softened his tone since the shootings two days earlier, told journalists that shutting down opposition press conferences was not part of the new Zimbabwe. If Mnangagwa had not sanctioned the police action, then who had? Activists say the government response was a rehearsed pas de deux: the hard men smash the opposition while a smiling Mnangagwa talks up reform and opens Zimbabwe for business. If so, such guile is unlikely to convince most observers. The post-election crackdown has reinforced observer criticisms of the electoral process, and many are believed to be writing private addenda with still harsher words. Amnesty International says that over 60 opposition activists were rounded up by armed men over the weekend. Some were beaten and some detained. In court in Harare on 7 August, the judge gave bail to 27 opposition supporters accused of affray in the capital. The Commonwealth observers were writing a formal assessment of the vote but also a separate paper for Secretary-General Baroness Patricia Scotland on whether Zimbabwe had successfully made its case to rejoin the organisation. There will be some trenchant remarks in that paper, we hear. Mahama and the Commonwealth Group came out with a tough critique of the government's use of troops and the shootings. Initially, Johnson Sirleaf was highly critical of the election but rowed back a little in press interviews, after discussions with Harare officials. Meanwhile, ZANU-PF's talented team of diplomats and spin doctors worked hard on the waverers and regional governments. Critically, they secured an endorsement from South Africa's President, and chairman of the SADC, Cyril Ramaphosa. He congratulated Mnangagwa and urged the opposition to seek redress through the courts. Mnangagwa's team may have done enough to allow the most enthusiastic business people and governments to step up re-engagement. Much will depend on the strength of the opposition's case at the election tribunal and the credibility of its handling by the courts. But with US sanctions set to continue, there seems little prospect in the short-term of a deal on Zimbabwe's arrears to the World Bank and African Development Bank, let alone new flows of cash from the IMF (AC Vol 58 No 24, Destruction in his wake). Contrary to the state-owned press insistence, there are no plans for a $2 billion credit line from Beijing to reboot the economy, despite its strong approval of Mnangagwa. There is a hard-headed view that Zimbabwe's economic morass is too deep, and its financial structures and parallel currency systems too fragile to be susceptible to a unilateral fix. Instead, new flows of cash, some from highly questionable sources, will come in. Financial toes will be dipped in the water, in search of what could be spectacular returns if the deals are cleverly structured. How these will help Zimbabweans, with the public health and education systems in chaos and jobless rates close to 90%, is another question. Prepared for Free Article on 23/04/2019 at 05:37. Authorized users may download, save, and print articles for their own use, but may not further disseminate these articles in their electronic form without express written permission from Africa Confidential / Asempa Limited. Contact subscriptions@africa-confidential.com.